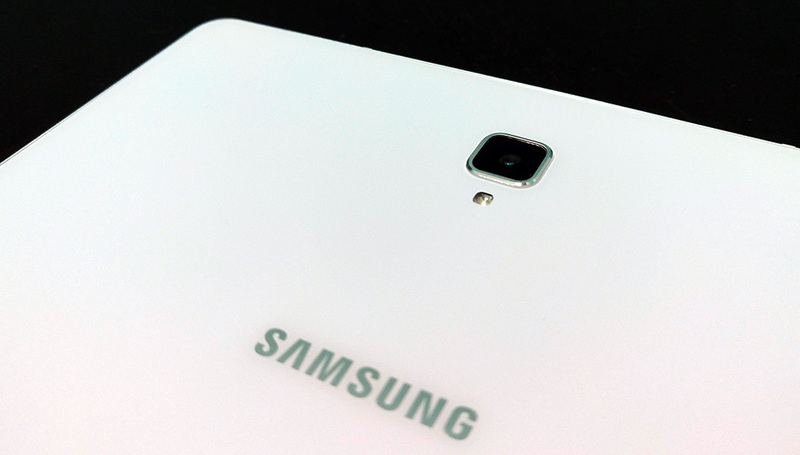 Samsung’s Galaxy Tab 4 is the best Android tablet in the market today. 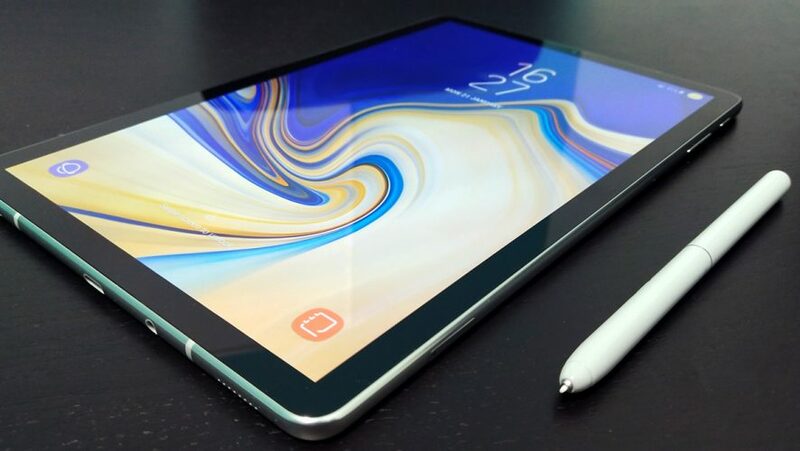 It is also the only noteworthy Android tablet currently in the market, because few other brands aligned with Google’s ecosystem opted to launch a flagship Android tablet in 2018. Even Google, which used to have a Nexus tablet, isn’t doing much with the Pixel Slate globally. One main reason is that Android isn’t designed for use on a large screen device. Android Honeycomb was supposed to fix that, but little has come out of it. Even Huawei, one of the rising stars in making Android phones, doesn’t have a strong Android tablet strategy. But as one of the more prominent leaders in Android, Samsung has a fight in its hands, even though this is a battle it didn’t instigate. Without a strong operating system of its own, it has to rely on Android, or risk being compared unfavourably to its main competitor, Apple, which has a strong phone and tablet ecosystem. But while Apple has adapted in the last eight years since it launched the iPad, to include the Apple Pen and dock support, a Google or Android tablet doesn’t conjure up the same use functions. Which leaves Samsung to fight this out alone. To harness the full 2-in-1 notion of a tablet doubling as a laptop, it introduced Dex a couple of years ago as an accessory that can transform a smartphone into a tablet when linked to a monitor. Here, Dex is a PC-like interface that mimics key laptop features, while still operating like a tablet. 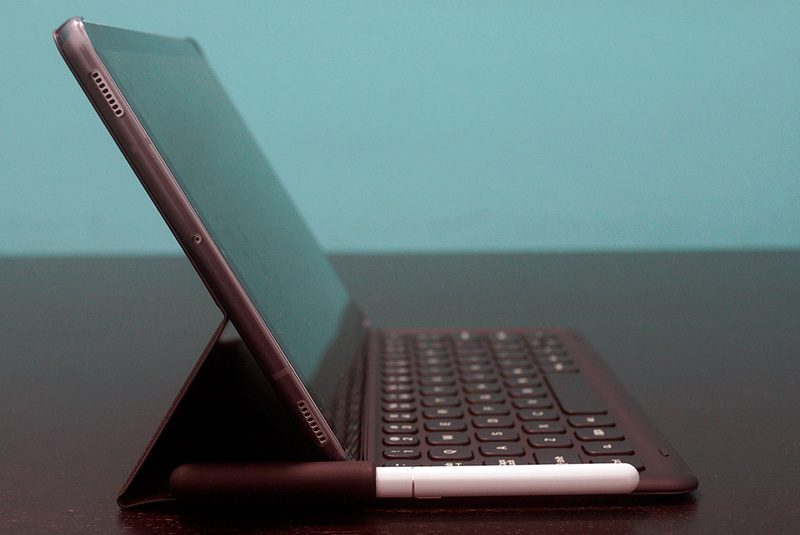 Want a tablet cover that also doubles as a keyboard? Samsung has you covered. How about an S Pen to mimic the Apple pencil? Yep. And a 10.5-inch Super AMOLED display (2,560 x 1,600 pixels) instead of a 9.7 one? Done. The catch is that the S Pen ($118) comes bundled with the tablet here, but the keyboard cover will set you back another S$228. Powered by a Qualcomm Snapdragon 835 mobile platform processor and offering 4GB of RAM in either 64GB or 256GB internal storage options, the Galaxy Tab 4 has the standard microSD support of up to 400GB, and a 7,300mAh battery that supports fast charging. Then there is the standard USB 3.1 Type-C port, 4 speakers, a rear 13MP camera, a front-facing 8MP one and an iris scanner. 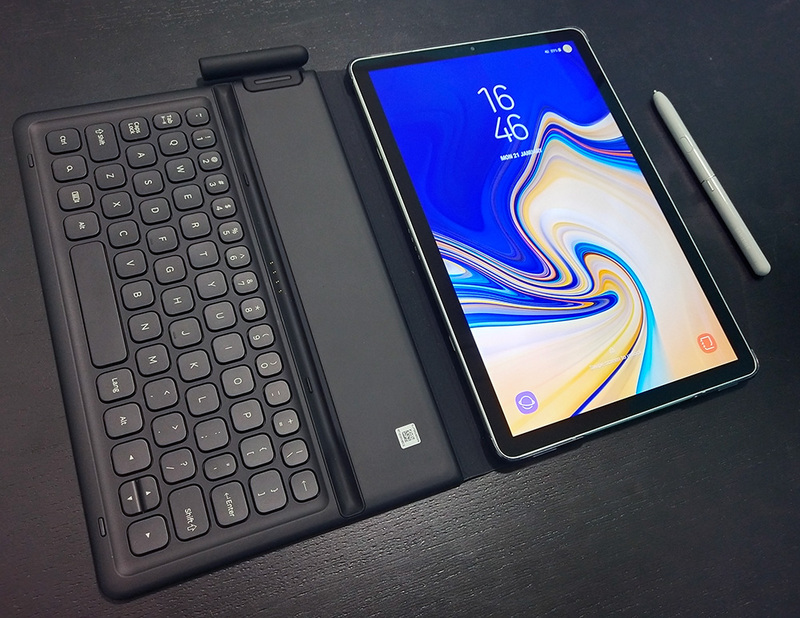 Samsung has gone out of its way to ensure that the Galaxy Tab 4 matches the features of the Apple iPad in many ways, and in doing so, has created an interface that can also compete with Surface tablets and Chromebooks, because as amazing as it is on a phone, Android 8.1 Oreo just doesn’t cut it on a tablet. Fire up Dex mode and the tablet, when used in landscape mode, offers a Windows like look, with network settings and clock on the bottom right corner, and icons neatly placed on the left side of the screen. Fire up some apps and the usual X on the right-hand corner of the window appears, ready for you to close it. The look and feel is comforting, and easy for anyone who has ever touched a Windows PC to navigate around it. Typing on the keyboard is also a relatively painless affair. 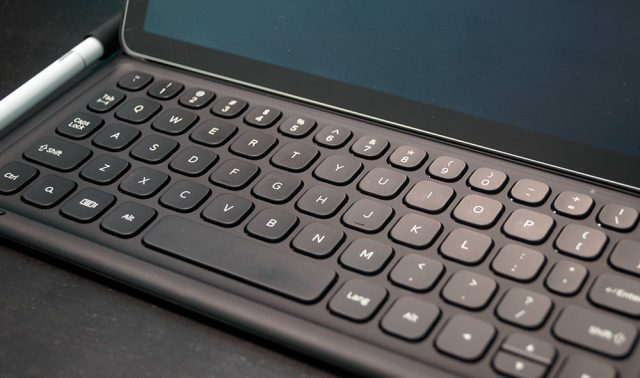 Unlike the soft keys on some Surface tablets, or even the official iPad keyboard, the one here offer a tactile feel to them. Certain keys are laid out differently, so there is some getting used to. If you want to run it as a tablet, simply disable Dex mode and voila, the usual Android tablet interface appears. Since Microsoft supports Android, you can find the full suite of Office apps on Android, from Word, Excel to Powerpoint, should you get frustrated with Google’s version of Docs or Sheets. But at S$998 for the Wi-Fi version, and S$1,098 for the 64GB LTE version, there are cheaper options that offers a similar experience. Microsoft’s 10-inch Surface Go is priced from S$618, for the 64GB model with 4GB of RAM. Sure, the Galaxy Tab 4 comes with the S Pen bundled in, but factor in the keyboard and the full features of the Galaxy Tab 4 comes at a price. That said, the Galaxy Tab S4 is not as cumbersome as a Windows device. Samsung has done a great job of melding Android with its Dex interface, to offer multi-tasking at a convenience. While it does not have a touchpad, the S Pen more than makes up for it as a precision tool. There’s even a case to hold the S Pen to the tablet, so you don’t have to deal with a separate mouse. It doesn’t need charging to work with the tablet, and is pretty precise as a productive device. One shortcoming though is that Android is still not the art powerhouse that Apple’s iPad is. Sure, Adobe Illustrator Draw is a great drawing app, but there’s no Procreate or Graphic or Concepts or ArtRage, and it goes back to the ecosystem that Apple has manage to cultivate to a specific group of creatives over Google. Hardware wise, Samsung has added AKG speakers on the tablet, which offer decent audio for a portable device. 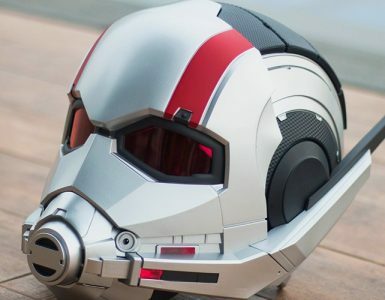 While it uses a USB-C connector, there is a 3.5mm audio jack, allowing users to charge the device and still enjoy audio at the same time. 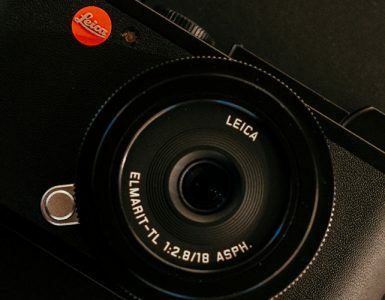 The larger 10.5-inch display is a boon, simply because consumers are used to larger screens, and this size is actually pretty small for laptop users. Samsung is pushing the boundaries of Android, but there’s only so much it can pull off on its own. 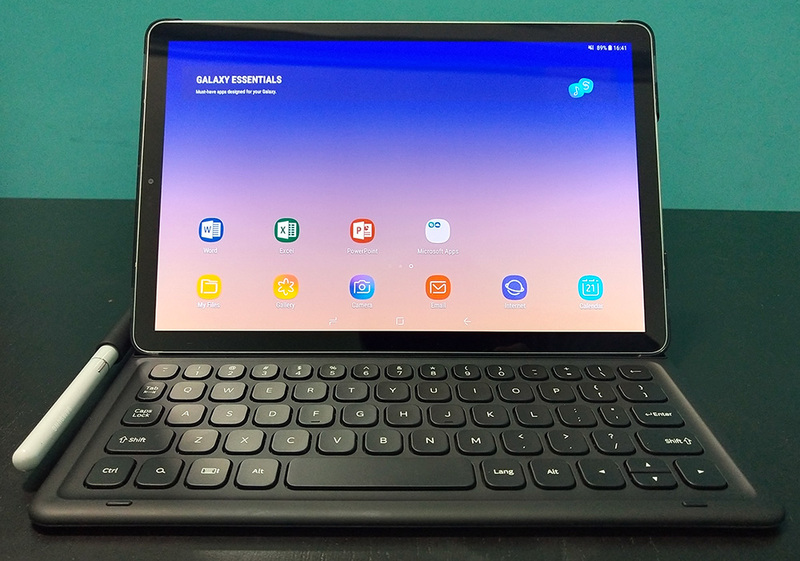 The Galaxy Tab S4 offers good hardware at a premium, but now it needs the software to augment the experience. At this price, the Galaxy Tab S4 isn’t for everyone, but if you are locked into the Android ecosystem, there is no other Android tablet that deserves your attention.